See others’ edits with co-authoring in Word, PowerPoint and OneNote. Improved version history lets you refer back to snapshots of a document during the editing process. Share right from your document with a click of a button. Or use the new modern attachments in Outlook — attach files from OneDrive and automatically configure permission without leaving Outlook. Review, edit, analyse and present your Office 2016 documents across any of your devices — from your PC or Mac to your Windows, Apple® and Android™ phones and tablets. Simply tell Word, Excel or PowerPoint what you want to do, and Tell Me will guide you to the command. Use one-click forecasting to quickly turn your historical data into an analysis of future trends. New charts help you visualise complex data. 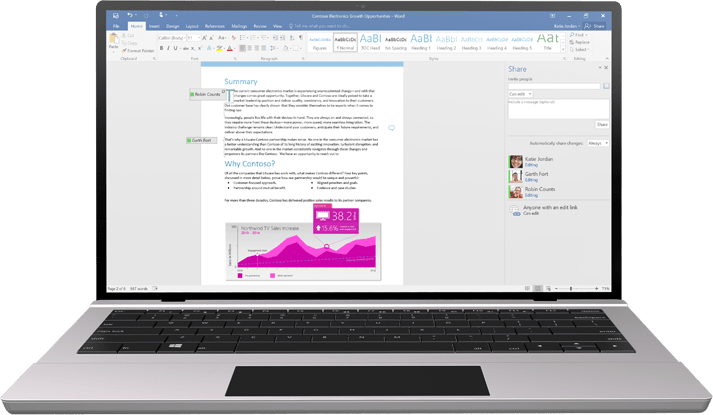 Office 2016 plus Windows 10 is the world’s most complete solution for getting things done. Say “Hello” just once and Windows will log you into your PC and Office — all in one simple step. Bring Cortana to your Office to help you get things done. Let Cortana with Office 365 integration help with tasks like meeting prep. 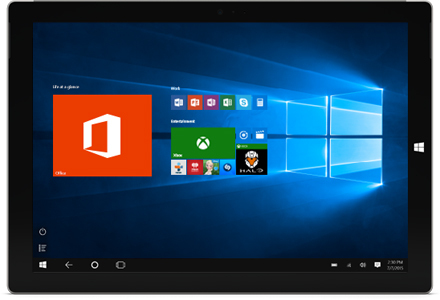 Office Mobile apps on Windows 10 are touch-friendly, fast and optimised for on-the-go-productivity.